Those were the days when one dressed up for air travel, a kind of flight ritual that required proper attire, as well as good grooming and good manners. My mom and I studied style books and magazines to come up with the perfect travel outfit for my trip, simple enough for a college girl but sophisticated enough for a college girl seated next to a diplomat, or someone even more important, maybe even a movie star. Back then, only “important” people traveled on planes. Neither my mom nor I had ever been on a plane before, although my dad had flown several times, him being somewhat important. My mom and I had settled on a hazelnut brown de pièce, as the casual version of the suit was known to the fashion savvy, which she copied out of Burda, the German style magazine that provided patterns for clever women like my mom who could trace out the selected pattern from a jumble of lines superimposed over each other on a printed spread of paper. I thought I was properly attired as I slipped into my seat on KLM’s DC 8 turbo jet, sitting on the tarmac as if it owned Istanbul international airport. Earlier that day, I had flown from Izmir on a Turkish Airlines twin-engine job, so already I felt like a sophisticated flier, although my recently cut and styled hair was misbehaving. How sad and insignificant my parents had seemed waving behind the chain-link barrier at Izmir airport, but as the plane lifted off the runway, leaving behind everything that was heavy and earthbound, my heart too soared with the joy of flight. But later that day, as I anticipated another thrilling take off, the pang of sorrow that was troubling me was for my parents anchored to their time and place behind the chain-link fence. But I had managed to get away. Away from everything that had held me down. Even as the stern-faced border police examined my passport before slamming the exit stamp on it, I had feared that any moment some glitch in my papers would be detected, and I would be prevented from getting on the plane. But here I was, ensconced in a cushy reclining seat (those were the days when passenger comfort was a concern), when I heard the stewardess speaking my name. Stewardesses, who used to look like beauty queens, were apparently required to learn the passengers’ names and brief biographies supplied by the airline agent. I suspected that the Whitehall household still ran on Rycaut’s dictum, so I was prepared to treat my flight companion with indifference, but the way the boy scrunched into his seat made me think he was already homesick. So was I. If I weren’t so sophisticated. “I know your older brother Clive,” I said just to get his goat. “I spent a weekend with him in Bursa.” Which was sort of true. “Oh, yes?” he said, moving closer to the armrest between us. I hadn’t thought Clive was a bore at all; in fact, I had a crush on him, a light case, which, thankfully, hadn’t lasted long because Clive had no real interest in me. For one thing, he was hopelessly smitten with Miss Gail Wood, an impeccably beautiful Texas debutante who taught philosophy and literature at the private American School for Girls where I’d been a student. In what I imagined must have been a philanthropic moment, Gail had signed up for a three-year stint teaching, or to be more exact, edifying Turkish girls with the essentials of clear thought and precise language if not the more gracious turn of phrase. I loved the way she said “literature,” giving each letter its due; but neither her voice nor her manners were languidly Southern. Rather than her beauty, which was merely incidental to her, it was the discipline of her intellect that governed her, and she tended to be exacting as a teacher, probably not unlike her father who was a much-decorated general. Remembering her now, I’d say Gail was an English rose hybridized in Texas into a long-stemmed American Beauty. No wonder Clive had been wild about her. I couldn’t take my eyes off her either. But Gail didn’t take Clive seriously. Not only was he more my age than hers (she being an old woman of twenty-five while Clive and I were eighteen), boys fell for her like flies, especially overheated, spoiled boys with too many privileges like Clive who think American girls are easy. The trip to Bursa was supposed to be just Gail and me, at least that’s what my parents thought when they gave me permission to go, but Clive turned up at the bus station sporting his tennis sweater and a naughty smile. His hair was khaki-colored and so thick that each strand was shimmering with good health. Gail couldn’t dissuade him from coming along, so she proceeded to throw Clive and me together, resorting to really obvious moves like changing seats with me so that Clive’s sleeping head would fall on my shoulder. What can I say? The feel of his hair against my neck was electrifying. The year before I met Clive, my classmates would have probably voted me “the girl most likely to do something interesting”, but I had waylaid myself our senior year, having agreed to marry the first appropriate suitor to ask my parents for my hand. What was I thinking? Had you asked me back then, I couldn’t have come up with the answer. I wasn’t really thinking because culture has an insidious hold on us; it binds us with invisible webs that are as heavy as chains: it captures us even before we start on our journey of individuation. My best friend Belma was the first to get engaged, even though after reading a book called The Snake Pit, about the sad lot of mental patients, she’d become passionate about preparing herself to become a psychiatrist. Her family was Circassian, who are reputed to be slim and good-looking but also quite conservative, and despite all her protests and tears, she’d been persuaded to make a stellar match to a young man recently back from America with an MBA, who was already showing promise to become the billionaire he eventually became, but not without Belma’s social skills and good sense, not to speak of the chromium mine her father owned down south. Belma said she’d fallen in love at first sight. “But what about med school?” I wanted to know. “What med school?” Belma quipped. I always sat up front and she took the desk right behind me and kept a running commentary at my shoulder, critiquing ideas and attitudes, because we never took anything anybody ever said at face value. So what had happened to us? Perhaps too many American movies at the Alhambra Theater downtown, heeding to love lyrics we knew by heart, like the Gershwin song, “Some day he’ll come along, / the man I love / and he’ll be big and strong […]” I thought Belma’s intended looked like an American bison: big and strong, and brooding. 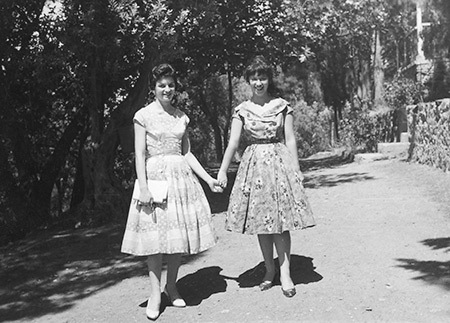 Güneli Gün (right) with her best friend Belma. Girls who went to our school made trophy wives for upper class men, so the culture wanted us spoken for before something unseemly happened, such as falling for the wrong boy or, for that matter, going off to America. The usual complement of school boys, as well as street riff-raff and sidewalk flaneurs, would wait at the school gate, trying to ambush us into talking to them, and failing that, they’d follow us, offering smart quips, catcalls and even crass comments. We knew better than looking them in the eye, or even sneaking a glance, which could encourage them to brush up against us; so we’d pretend we were oblivious of their presence if not downright deaf to their clever remarks. All that senior year when I was so deeply involved with schoolwork, dramatics, art history, world literature, philosophy, psychology, astronomy, all of which I had finally come to love and excel in, I was also writing long passionate letters to my fiancée who was an up-and-coming Istanbul architect. My epistolary style improved day by day while his letters back lacked something; they were so uninspired, well, almost trite, but when he came into town, he did things that fired up my body. He took me to nightclubs, and he taught me to smoke cigarettes and drink gin, not to mention deep kissing. He was that legendary lover, built like a classical period statue of Apollo, projecting both manliness and gentleness, but I didn’t yet know that Turkish men who are great lovers often make bad husbands. For one thing, they’re always looking around for another woman to love. The first sign of trouble came when my American teachers pooled their resources together and awarded me with a two-week trip to Stratford-upon-Avon for the Shakespearean festival. The fiancée had the nerve to forbid me from going. “I’ll take you there myself when we’re married,” he said. “But,” I said, “you don’t even speak English!” “So you’ll translate for me,” says he. My opinion of him was seriously compromised. Translate Shakespeare simultaneously? Obviously he knew nothing about the Immortal Bard. I was beginning to understand I was more in love with Hamlet than I was with this fiancée. At the end, though, I passed up the trip to England, but my summer was ruined stewing over my lost chance. Slowly it came home to me that in September, when I was supposed to enter Academy of Fine Arts in Istanbul, he’d prevent me from enrolling, although we had agreed on it when he put the ring on my finger. He sent me posh coffee-table books on French impressionist painters, as a way of educating me himself I suppose, but when we married, I had a feeling he’d trap me in a fancy Istanbul apartment to make babies instead of art-while he looked around for someone who wasn’t pregnant. I told my parents I was sending back the ring, all the gifts, the books, and, most importantly, his lousy letters. My dad was “confounded!” He wanted to know why I’d said, “yes” if I hadn’t known what I was saying. Not only had he given me an expensive “engagement ball” at the Officers’ Club (he was a veteran war hero, having served as a field surgeon on the battle front), he had custom ordered my entire bedroom suite, ultra-modern and chic, designed by the Bauhaus-minded fiancée, and almost ready to be delivered. What was he supposed to do about it? My mom had been working on my trousseau; linens and things had recently come back from the embroiderers, cutlery and china dinner sets for twelve and tea service for twenty-four had been bought. My parents had a progressive outlook, they were affectionate and understanding, but they hated being left holding the bag, especially my mom whose snooty Alsancak relatives would be raising their eyebrows for decades to come. I decided my best course was to weep copiously. Seeing how I was already on a liberal arts track, I said I wanted to go to college in the United States, something that very few Turkish girls got to do back then, something that was frowned on as well as being terribly difficult financially because those were the Menderes years when Turkish national treasury was running on empty. My dad, who was a doctor, had spent his life directing socialized medicine projects for the poor and disenfranchised, so he wasn’t rolling in money like some society doctors. Besides, who could afford the sort of tuition charged by American colleges when foreign banks had only contempt in exchange for the Turkish lira? Well, I’ll get a scholarship, I said; I’ll get a job and pay for my airfare myself. “All right,” my dad said. “If you can earn your way, I’ll help you go.” I don’t think he really thought I could do it. Although he didn’t make an issue of it, he hoped I’d stay and go to med school; my mom’s heart was set on the school of diplomacy, and the career track she had wanted for herself. The first thing that occurred to me was going to see Mrs. Blake, the head mistress at the American school where I had been so happy for eight years, starting with boarding school at age eleven and ending up getting the American education my parents had always wanted for me. Someone should have told them to be careful what they wished for because I had overshot their dreams. I was no longer fit to be a good Turkish wife and mother, as evidenced by the debacle at hand, let alone a career woman with a useful diploma from some professional school. I suppose my passing up the trip to England had made Mrs. Blake wonder what was going on with me; and although she didn’t say it directly, I could tell she had been dismayed by my decision to throw my talents into the wind and tie myself down with domesticity. Lynda Blake was made of New England steel, an overpowering and overbearing Amazon with a gray pompadour, and a chiseled Charlton Heston profile. She was a second-generation cultural missionary, groomed from birth to take charge firmly and without apology; she was all Boston and Wellesley, but unlike other Americans of her class, she spoke Turkish better and faster than any educated native. There was a school myth that she was seen in two different places at the same time, as well as having eyes in the back of her head. She absolutely terrified all the girls, and it was only in the last year or two I had been able to see her as a person myself. Once she was through interrogating me about my plans, she agreed to hire me as the language lab assistant, drama coach to lower forms, and Turkish instructor for the new American teaching staff-all this for a salary slightly above a pittance. Running the English language lab for beginners was too mechanical for the likes of me (an aspiring actress, artist, and writer), but I did have a way with middle school girls who are often surly and stupefied with the onset of raging hormones. Fortunately, I was something like a celebrity in these girls’ estimate; they had already seen me on stage, playing the lead in all the major school plays, Jane Eyre and Taming of the Shrew, and Elizabeth Barrett Browning in Barretts of Wimpole Street. Often they’d address me as Miss Eyre, and they were willing to listen and take stage direction without their eyes glazing over or slipping backwards with disgust. I was the envy of the new crop of young American teachers some of whom were unable to stop the girls from whispering, passing notes, daydreaming, and making noise. The permanent teaching staff were old-timers with residual missionary tendencies, and they all spoke Turkish after a fashion, but their numbers were rejuvenated and brought up to date by incorporating recent college graduates hired on short contracts. Gail Wood was one of the five or six such young persons in the Turkish class that I presumably taught but wished I didn’t. Language teaching is like lifting an elephant, especially if the students have no intention of learning some out of the way language like Turkish. The lessons required them to repeat after me phrases and sentences that the authors of the textbook thought might come in handy, over and over, until they got it right! Ten minutes into the hour, their eyes would glaze over like middle school girls’ eyes, and they’d be trying to hide from me their inadvertent and contagious yawns. Pretty soon I too would be yawning and struggling to keep my eyes open. Gail Wood taught juniors and seniors, who seemed to have succumbed to her charms, but she herself turned out to be a particularly untalented student of Turkish; it was obvious that this girl was unlikely to put two words together on her own. Even a rank beginner like me could sense that the perfectionist in Gail had a difficult time being the worst student; so when I suggested that I audit her senior philosophy class, I imagined she’d reveal to me her real métier. My actual senior philosophy course had been something of a joke, taught by Reverend Jack Blake-Mrs. Blake’s amiable but kind of goofy husband-whose lectures were more like sermons, making me think religion and philosophy don’t mix. Gail had been a stellar philosophy student at Hollins College, I was to find out when I got there, as well as the president of the student body, the Phi Beta Kappa, the Grapheon Society, editor of the literary journal, etc., etc., before going off to Harvard for her masters. So what was she doing in Turkey? Perhaps Providence had sent her to aid me to break loose. I’m just kidding, of course. I had no choice but to surpass myself that year, otherwise my best intentions would have been reduced to idle boasts. To get a scholarship to one of the selective liberal arts schools, I had to ace the SAT college entrance exams, so I wrote hundreds of big words on flash-cards, and I flipped them from pocket to pocket whenever I had a spare moment, memorizing the meanings and the usage, thereby providing myself with a huge vocabulary. Besides re-reading Plato and Aristotle that Gail was so keen on, I was into heavy-duty writers, such as James Joyce, Virginia Woolf, Faulkner, Sartre. But I was no Gail Wood, even though she tried treating me as an equal. For one thing, I had a gaping deficit of personal freedom as a citizen of a bankrupt county, while Gail had a passport that opened to her the whole wide world. Stuck somewhere between being a responsible adult and a resentful teen-ager leading the daughterly life, I thought I was being held captive in a cultural prison where, despite the American education, I was still confined in my parents’ moral universe. As I understood Sartre’s existentialist thought, “bad faith” consisted of pretending that we are bound to our way of life, convinced that even if we tried, we had no power to escape notions of duty and deeply rooted belief. I wanted to be free of “bad faith.” Human freedom brought “anguish” and “nausea”, springing from the recognition of “nothingness.” I painted a portrait of myself, a good likeness I thought, on a background of funereal black nothingness, and I titled it The Isle of the Dead. I felt I had committed symbolic suicide, but so I wouldn’t distress my mom with my self-inflicted anguish, I hid the picture in my closet, fearing the unbearable tenderness in her bright hazel eyes. With love like that who could possibly be free? No matter what, “bad faith” seemed to follow me everywhere. Then I tried out for the role of Antigone in Jean Anouilh’s modern version being put on stage at the Little Theater downtown, and I got the part, my first semi-professional role where the male parts were being played by real males instead of boyish girls wearing painted mustaches. Antigone defies her uncle King Creon’s edict prohibiting the burial of her two brothers who have killed each other, and she buries them on pain of her own death. At once dutiful and at yet rebellious, Antigone was me! As it happened, I was admitted to all the elite colleges I had applied to, but Gail’s alma mater, Hollins College in Virginia, an all “girls” school, was the one that offered me the most lavish full tuition and board, thanks to Gail’s efforts painting me as a most desirable candidate. My mom and I spent the summer working on my Hollins trousseau according to the handbook we were sent on what to expect and what to bring. It was quite detailed. I could wear flats and high heels to dining hall, but not loafers and Bermuda shorts. I needed two formal gowns for Cotillion weekend, a hat for church, shirtwaist dresses for class, and a camelhair coat. I could date Washington and Lee boys, cadets from two Virginia military schools, and catch a ride to University of Virginia because chaperons would be provided at those locations. “You better think twice before you date anyone,” my mom said, “you’re not going there to provide entertainment for American boys,” and she made me promise I’d drink milk and not smoke cigarettes. She knew I already sneaked Salems out of her cache of American cigarettes she kept for company, but it was an open secret. At night I went out on the terrace, smoking and studying the star chart while circumpolar constellations went around my head dizzy with mint-laced tobacco. My dad was amused to read Hollins had fine stables and a riding mistress who was a Hungarian countess, and I was invited to bring along my horse. He kept teasing me about our milkman’s old nag whom he offered to ship with me on the plane so that I could participate, as the handbook promised, in Virginia foxhunts enjoyed by landed gentry. And here I was on the plane, without the milkman’s horse but with an English boy who reminded me of myself at age eleven leaving the bosom of my family to go off to boarding school, except this boy was going to some famous “public school” for ruling class boys. He was plenty terrified. Having grown up in Turkey, he was afraid English boys wouldn’t like him; he was worried English relatives who were supposed to meet him at London airport wouldn’t show up. I had similar worries, but I assured him it would be the best adventure of his life. While we waited to make our connections at Frankfurt Airport, we were invited to have dinner on KLM at the airport restaurant, which was quite crowded, but a small two-person table was found for us. We were both too keyed up to eat. I noticed the man at the next table, who for some reason looked Bavarian to me, perhaps because of his hat. He was apparently keeping an ear on us when the boy wanted to know, as boys like knowing things that concern geography, where Frankfurt actually was. “We’re Turks,” I told the man, letting him make of it whatever he wanted, “and we don’t know what you are talking about.” If I remembered my geography right, the Ruhr was further west, and this man was talking through his Bavarian hat. Maybe he wasn’t Bavarian at all. As I walked the Whitehall boy to his gate, he slipped his hand in mine. In New York, I was to be met by two ladies, friends of my geology teacher, Miss Ross, who had prevailed on them to come into New York from Lynnfield, a town not too far from Boston, just to meet me and make sure I didn’t get lost trying to locate my trunk, which my dad had carefully scheduled to arrive the same day as me on a freighter called SS Newberry Victory sailing under the Norwegian flag. If the ladies didn’t show up, there was a distinct possibility I’d get lost, and I had only forty dollars in my handbag. Miss Ross had instructed me to present myself at the Traveler’s Aid counter where the ladies were to meet me, and if they failed to show up, the person behind the desk would certainly help out, an eventuality that sounded ominous to me. But the ladies were there, looking me over with great curiosity which made me think that they hadn’t seen a Turk before, or perhaps having swallowed a steady diet of Armenian propaganda, they expected me to perform some sort of atrocious act. They were elderly, hatted, gloved, bespectacled, and wearing plaid suits just like Miss Ross. They were dubious about the freighter managing to arrive as scheduled, but they called the agency anyway and found out SS Newberry Victory had just arrived and was steaming to Staten Island where it would dock. I sighed a sigh of relief, only to be told the agent thought it was highly unlikely the freighter would get unloaded anytime that day. The ladies helped me drag my suitcase on the airport bus into town and even paid for the fare. The last place I wanted to be was on some island off New York, but the ladies were intrepid, as if squiring me around were a test of their Christian virtues. They bought me my first hamburger for lunch and ate theirs daintily while I thought I’d upchuck the whole thing, yellow American mustard being the nasty culprit offending my palate. The ladies paid for the taxi to the Staten Island ferry, paid for the tickets, and we sat out on the deck. Seeing for the first time the New York skyline for real, and not in a movie or a newsreel, something like an experience of awe and wonder came over me. It was a hazy day; edges of the skyscrapers were blurred gray, as was the Lady Liberty rising out of the vapor like a genie materializing in a fairy tale. The ladies paid for the taxi to the warehouse at the docks where we found ourselves in a cavernous building. Our next task was having to reason with a pair of enormously fat Italian stevedores in their underwear who were sitting at a makeshift table made of some crates and wolfing down a huge lunch. I didn’t know at first that they were Italian, of course, only surprised that they were so fat. Turkish stevedores are often thin as rails, hungry, and treated like dirt. “No can do” was their refrain to the ladies’ every plea. But they managed to get across that I needed a “bill of lading,” whatever it was, and pay a broker to see the trunk through customs, who’d then ship it railway express to my college. How much would all this cost? Hundred fifty smackers ought to do it, they said and they kept eating and picking their teeth, unconcerned with my plight. That’s when I resorted to tears, sobbing that I had only forty dollars on me, and without my trunk my life would be ruined, etc., etc. Somehow I managed to impress this pair of enormous men to take pity on me, and they were moved to see what they could do. When they left, one of the ladies complained how these Italians eat so much garlic that their breath practically sets the place on fire. I didn’t care if they smelled to high heaven when they returned with a blueprint of the freighter’s cargo placement, and to our surprise, we found the little square that represented my trunk with my name printed on it. Hallelujah! The men went off to fetch it, and presently they turned up with the trunk looking none the worse for wear, presumably still containing cotillion formals and the camelhair coat and everything nice, and they said they’d railway express it to Hollins for fifteen dollars. I handed over the money without even asking for a receipt (to do so seemed shabby after all they’d done for me), but I did wonder if I’d ever see my trunk again. All sorts of red tape circumvented so satisfactorily, and probably illegally, the ladies were eager to get back home to Lynnfield and needed to deposit me somewhere. I too wished to see the last of them; it made me cringe that these ladies had been roped into spending so much time and money on me. I wasn’t yet used to taking charity, something even the most hoity-toity of immigrants must learn to accept with equanimity. Just imagine, when Nabokov arrived in New York, all he and his wife had between them was a hundred dollar bill and the address of a friend-and he had grown up in palaces eating caviar. Gail had assured me that her college roommate, who had married a clergyman and lived in Manhattan, would be more than happy to put me up for one night, but just to make sure, she would call and warn them I’d be arriving in need of a place to drop my jetlagged bones. So the ladies and I phoned a total stranger, only to find out Gail had never made that international call, but the woman on the line invited me anyway. She was very fond of Gail. The ladies again paid for transportation, and I arrived in Manhattan, the glamour heart of America, where I was handed over, like the sad sack I had become, to a young woman who looked a bit like Doris Day. It was a tiny apartment but the sofa made into a bed. I managed somehow to entertain them all through supper, probably with stories about Gail, but I was chattering out of a motor impulse; I myself was far, far away, in a fog, in a dream, as if something terribly heavy had hit me over the head. I was too tired and bewildered to really take in my hosts who will always remain foggy in my memory. The next morning the husband drove me to the airport in his VW bug, and I was airborne once again, happy to leave New York behind. I had a grudge against Metin. My dad had written asking him to sort of look after me in the U.S., appointing Metin my “guardian,” I suppose. But Metin had written back that under no circumstance was I to be sent to America where morals were lax and a girl could get herself in trouble. Get pregnant was what he meant, I suppose. I was livid. He didn’t know who I was, and yet he was already passing judgment on me! Considering how I resented Metin’s repellent advice, I would have preferred not to make a stop in DC, but my dad wanted me to show my half-brother my sterling qualities. Good luck! Metin had already decided I was a nuisance, and he treated me as he treated his wife, females who could hardly be expected to understand “rigorous Jesuit thought.” Kelly wasn’t too much older than me, but she had already borne her first child, a horrible infant who screamed and kicked almost constantly, yet she somehow managed to sleep through it all; she slept and slept, earning the title of “The Sleeping Beauty” in my letters back home. Metin was disappointed that I didn’t know the first thing about cooking; he had thought my unwelcome visit would have been somewhat mitigated by my producing some Turkish food he was hungry for, as their diet consisted mostly of sandwiches that Kelly, in between her naps, managed to slap together. On my second evening there, they asked me to take care of the holy terror while they stepped out and took in a movie. I was even less adept as a babysitter than I was as a cook. Before I left, Metin made sure I understood our dad was a fool for letting me come; Hollins was nothing but a finishing school where rich southern belles went to get on the marriage market. Metin was wrong about Hollins, although perhaps he was not wrong about me being “a spoiled brat” for whom everything was made easy. Perhaps I was wrong about Metin, too; perhaps he was only holding my feet to the fire. Later on in our lives, I understood Metin’s method of teaching was adversarial; he teased and offended, and he certainly got me mad enough. Sure, some Hollins girls were determined to get that ring on the finger by senior year, but others hit the books, haunted the labs, studios, library stacks, and discoursed into the wee hours of the night. My roommate “Hutch”, for example, became a world class player in the field of neuroscience; Jane was appointed poet laureate of Kentucky; Shannon founded a major literary publishing house; Annie received the Pulitzer; and, once the women’s movement opened the way, the “girls” were named CEOs of companies that run the world, arbitrate taste and opinion, fund noble causes. But for me Hollins was Mt. Parnassus, not only because it’s an idyllic campus in the Blue Ridge Mountains, but also because the Muses were everywhere, some of them in tweeds and smoking pipes, others steeped in defiance to easy answers, all of them devoted to liberating arts. I felt sorry for girls who were “co-eds” at other colleges, having to sit in the back and keep their mouths shut while the boys in the front had their say. When Dr. Coffin went by with his Freedom Riders, my roommate “Hutch” was one of the girls riding the bus to Mississippi while I had to stay behind because we thought if everyone got arrested, I’d be the one getting deported. The integration of Blacks into white Southern society wasn’t my fight, yet it would have been fitting for me to ride the bus called Freedom. Even so, playing the “foreign student” was the best part I ever got, a role not unlike the Licensed Fool in a Shakespearean play. Looking back, I see that I’d found what I needed at Hollins: neither bound by my own culture’s dictates, nor yet assimilated into the American experience, I had the freedom to be myself-for a few, precious years. When I landed at the Roanoke airport, my “group leader” was waiting for me, a pretty girl wearing a madras plaid shirtwaist, the sort of dress I’d read in Mademoiselle magazine that was a “must” for the preppy college girl. She was a junior, she said, from Alabama. I felt foreign in my hazelnut brown traveling outfit and high heels. “Y’all have such a cute little accent,” she told me. For a moment, she was non-plussed and then she laughed self-deprecatingly. “Sure got me there,” she said. “When everyone around you is drawlin’ away, you hardly notice your own drawl’s thick as molasses.” Some time later, I found out she was translating Plato’s Republic into symbolic logic. Life’s ironies never cease. The Italian stevedores hadn’t managed to lose the trunk, as I had feared they might; my trunk was waiting quietly at the foot of my bed. Güneli Gün (Güneli T. Hershiser) is a Turkish writer who publishes in English. She lives in Oberlin, Ohio, where she has been teaching creative writing and women’s studies at Oberlin College for many years. She is the author of Book of Trances: A Novel of Magic Recitals (1979) and a picaresque novel entitled On the Road to Baghdad: A Picaresque Novel of Magical Adventures, Begged, Borrowed, and Stolen from the Thousand and One Nights (1991; rpt. 1994). John Barth has said that she is “a shrewd and magical Turkish-American storyteller, sired by Garcia Marquez.“ Gün is a regular contributor to the Paris Review and the World Literature Today. She is the translator of three major Turkish novels into English, among them Orhan Pamuk’s The Black Book (1994) and The New Life (1997). Gün, Güneli. “Flight to America.” American Studies Journal 55 (2011). Web. 24 Apr. 2019. DOI 10.18422/55-05.